Top News Responsive Blogger Template is a news portal blogger template with responsive and fast loading design, it comes fluid layout that will adjust its size according to specific device screen. It is specially designed for any kind of news, newspaper, tech, gadget, review, howTo, food, blog, magazine, personal type of website. It is very high optimized template and will perform extraordinary in search engines. There are some specially designed ad slots to generate better revenue through your blog. 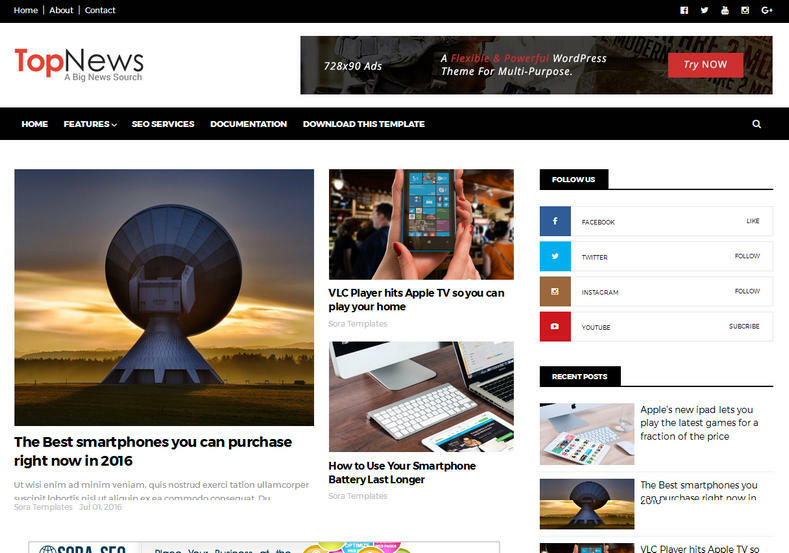 It comes in black, red and white combination which you can change through blogger template customizer. Those who want to create simple looking blog design which doesn’t look messy, but has some important widgets so that it can be used to display important updates of your blog then this template is perfect for you. With this template, it is very easy to create a professional looking and well managed blog and make your blog an authority in particular niche. Seo Ready, Ads Ready, Responsive, Adapted From WordPress, Fast Loading, Browser Compatibility, White, 1 Right Sidebar, 3 Columns Footer, Technology, News, Social Bookmark Ready, Slideshow, 2 Columns, Drop Down Menu, Post Thumbnails, Page Navigation Menu, Fashion, Personal Pages, Magazine, Breadcrumb Navigation Ready.